Posted in News, Status on November 28, 2018 by erik.rasmussen@noaa.gov. With the news being about Midwest blizzards, Black Friday, and Cyber Monday, it doesn’t seem right that VORTEX-SE should be active. But we are. Over the last couple of years, we have grown increasingly concerned about observing the “cool season” tornado events in the Southeast. The peak occurrence of killer tornadoes in the Southeast spans a broad season from October through early May. Tornadoes this time of year are especially concerning because of the perception that tornadoes are a springtime phenomenon. People let their guard down during the fall and winter. On Friday, an upper wave and jet stream will be plowing into the Southern Plains. As pressures fall, strong low-level flow will develop off of the Gulf of Mexico, transporting warm humid air inland. Combined with the upper level jet stream flow, profiles of temperature, humidity, and wind ought to become favorable for increased tornado potential, first in east TX, LA, and AR Friday evening, and spreading east into MS Friday night (30 Nov). The system will then chug east into AL/GA on Saturday. At some point, it will outrun the richer Gulf moisture and move into the cooler drier continental air left behind by the last system over the eastern US, and the tornado threat should diminish. This cool season, VORTEX-SE will be doing an experiment aimed primarily at improving forecasts of tornadoes on time scales from a few hours to about 2 days. Starting at about the time the upper system enters the Plains, many Southeast NWS sites will be launching soundings every six hours, continuing for 48 hours. In addition, university and NOAA Lab partners will be launching soundings at the same times from College Station TX (Texas A&M), Fort Smith AR (NSSL), Monroe and Breaux Bridge LA (University of Louisiana at Monroe), Memphis TN and Starkville MS (Mississippi State), Mobile AL (University of South Alabama), Huntsville AL (University of Alabama-Huntsville), and Montgomery AL and Oak Ridge TN (NOAA Air Resources Lab, Atmospheric Turbulence and Diffusion Division). In addition to this regional-scale observing campaign, we will be doing “nested” finer-scale observations in northern AL to get a look the details of the features we detect moving through the larger domain. This will include two “CLAMPS” profiling systems from NSSL and OU, as well as profiling, mobile radar, and mobile sounding systems from the University of Alabama-Huntsville. And the Texas Tech instrumented surface network (“Stesonet”) will be making observations across northern AL and southern TN, with instruments spaced roughly in every county. 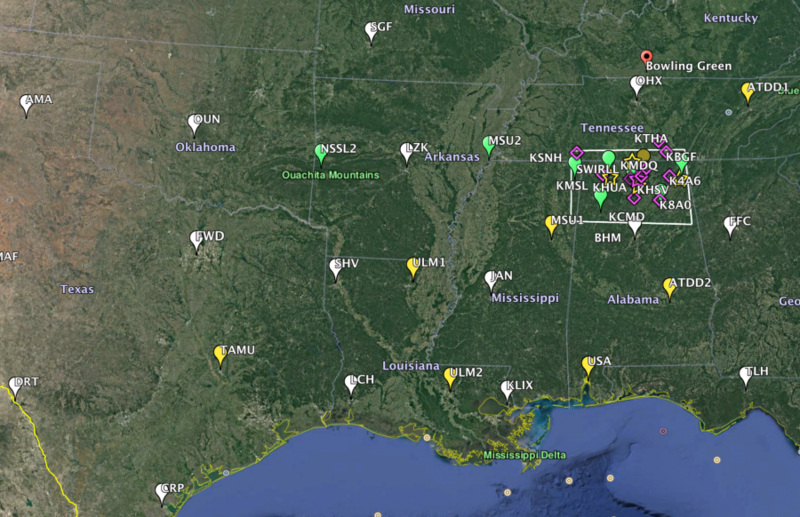 All of this is part of the ongoing VORTEX-SE effort to improve the forecasting of, and human response to, tornadoes in the Southeast. These tornadoes are unlike their Plains counterparts in that they occur across a longer part of the year, are much more likely to occur at night, and occur in complex scenarios and from storm types that just have not been studied very well in the past.